The "Kickin Back Pants" were a fail. I had intended to make them for my little buddy Kail (who's two and this was the size 2-3 pattern) but they were much too long. I tried to hem them to fit but by the time I was done, they were all crotch and very little leg. I appliqued a cute pocket but decided I hated it and took it off. The boy tried them on so I could get the legs even. He loved the feel and the short length so I let him keep them. They could be summer short pants except I lined them in flannel, which seems contradictory. So, they are sleep shorts in the 80's Jams style. Totally Awesome dude! I wasn't giving up on making pants for Kail though so I sewed up the "Mr. Two Faced" pants which came with smaller dimensions. These are the 12-18 month size. I didn't have two contrasting knit fabrics so I just used one fabric. Now, this is a cute pocket! These were fun and EASY to make. No hemming required on these super casual pants. I used a 70/12 ball point jersey knit needle and set a zigzag stitch at 3.0 long and 1.0 wide. I also top stitched all the seams down to make them more comfortable. I'll be making more of these. 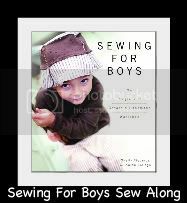 I just wish I could find some affordable and cute cotton knit fabrics for boys. Slim pickings out there for the guys. 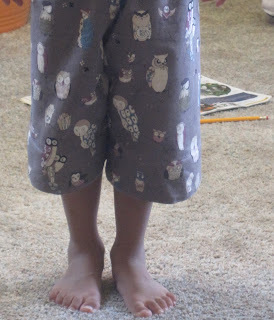 Tip: To make the pocket, I used double sided, light weight fusible web, and fused the two fabrics together. To get the pocket to stay put while I sewed it on, I used Elmer's washable school glue and a hot iron instead of using water soluble basting tape (which the book calls for). The glue washes right out after laundering. Here's a silly picture of the boy flying. Such a happy kid, kicking back in his Jams. The 80's are back and he's styling! 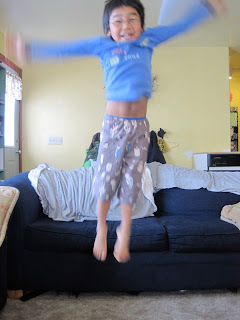 I think the Kickin' Back sweats totally work as short. I say give it ago again with a light weight fabric and you've got a summer wardrobe. I agree on the boy themed knits though. If you're willing to spend a bit extra, Spoonflower will print most of their designs on organic cotton knit. Thanks ladies. Spoonflower is pretty amazing. I don't think I'd mind a small splurge for something special at this point!